This week 3,153 cards were mailed out – at a cost of $134.45…we’re on a rest break! Well, Sandy and Kris are, but Caro’s on the job and mailed most of our boxes this week. THREE CHEERS for Caro making it through her first week as OWH’s new east coast shipper!! Many thanks to Dixie for being around to answer lots of questions too 🙂 You can find both ladies’ addresses here….so if you’re an east coaster you now send to Caro; if you want to send Dixie a thank you note, you can do that! 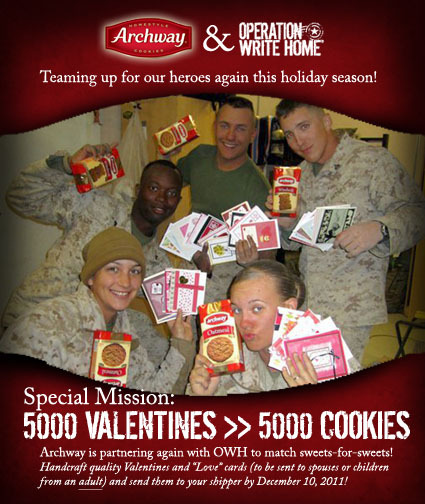 But don’t forget – we’ve got an Archway challenge going and want to get valentines and cookies out to our heroes, so keep those cards a-coming!